Now, Hua Yue confirmed that Mei had become different after practicing the “Closed Mouth Zen”. Her point of view was different from Mei Lan. As a civilian girl who was born in a common family, Mei Lan had natural disbelief of others. Even though she was a member of the Starwing Knights and she loved the Knights, as the secretary, she cared about details too much. She wanted to control everything in her hands, including the accounts and logistics of the Starwing Knights, and even all information of every girl. Hua Yue was different. As the leader, what she paid attention to was in a higher level. Of course, a healthy organization needed members like Mei Lan, who was willing to devote herself into it; and a mascot like Ling Ling was also demanded. She was the leader, her duty was to make the best use of their talents. Therefore, compared to Mei Lan who focused on the financial expenditure of the Starwing Knights, Hua Yue paid more attention to the interpersonal relationships between different girls, especially when it was related to Mei. Mei was the core of the Starwing Knights, the Knights was formed for her. Why did this newly formed organization have such a high cohesive affinity? In the few days after they arrived at the Sword Palace, a lot of forces had made various commitments to almost all members of the Starwing Knights. They didn’t even hide their intention of undermining the foundation of the Knights. However, no matter what the force was, including the forces even Hua Yue felt difficult to deal with, none of them had succeeded. None of the girls chose to leave. Even though they knew several forces were supported by legend ranked people, these forces were far stronger than the Knights, a girls’ organization was like “playing house” in the eyes of a lot of people. There was only one reason that could explain it. Because Mei was here. If Mei chose to leave the Sword Palace, none of the girls of the Starwing Knights wouldn’t follow her footsteps. Since when had they become so intimate with Mei and regarded the black-haired maid as their god? As if there was an invisible thread that was connecting all the girls of the Knights together. And the thread was becoming more and more sturdy as time went by. At first, Mei was just an unknown girl whose appearance fitted the profile of the tales of the black-haired girl, which made them nerve themselves to ask for a strand of hair from her. Now, the lucky charm made of Mei’s black hair had become the holy badge of the Starwing Knights, only the people who had the lucky charm was allowed to join the Starwing Knights. “Mei… is it hard to practice the ‘Closed Mouth Zen’?” Looking at Mei’s innocent face, Hua Yue made a guess in her heart. Secret skills like “Closed Mouth Zen”, as far as she knew, they needed the practicers to undermine their five senses to strengthen their mentalities. Once a person started to practice the secret skill, the person couldn’t give up halfway, otherwise, the person may go mad. When practicing the secret skill, various temptations would naturally appear, and once the practicer failed to resist the temptation, something terrible would happen. In a word, even to dervishes, it was one of the most difficult limit practices. “…” Mei (Star Fire) looked at Hua Yue’s hand with curiosity, she naturally stretched out her tongue and licked her hand. Her small tongue touched Hua Yue’s tender skin. Although she had seen this in the videos the holy beetle recorded, when it really happened to her, Hua Yue still couldn’t help but emit a light groan. The current Mei is too cute! No wonder that Lulu, Ling Ling, and Mei Lan couldn’t withstand this kind of intimacy. Even her, when she looked at the puppy like Mei, she had zero resistance against her behavior. If it wasn’t because her senses warned her that if this went further, she would recommit the same mistake like Lulu, Ling Ling, and Mei Lan, she would be immersed in this sweet trap and fall into Mei’s arms. No! I’m the leader of the Starwing Knights! I can’t do this when Mei is in this special state! “Mei… let’s cut class today!” After thinking for a while, Hua Yue asked in a calm tone. Since the opportunity appeared, I must carefully plan it and use it in a more effective manner. It’s a rare, wonderful time that I can ask for anything from Mei and won’t be afraid of being refused. The time for love is valuable to girls! 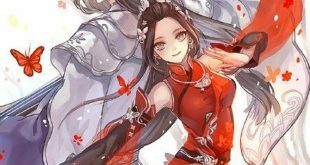 “…” Mei (Star Fire) smiled and naturally moved closer to Hua Yue. The body instinctively found her mouth and kissed her on her lips. There was a kind of sweet, soft, pleasant smell. Star Fire thought that she had slightly understood why master and my sister likes this smell. “Oh… ah… Mei… do you agree?” Immersing herself in Mei’s deep kiss, Hua Yue smiled. Everything is under my control.